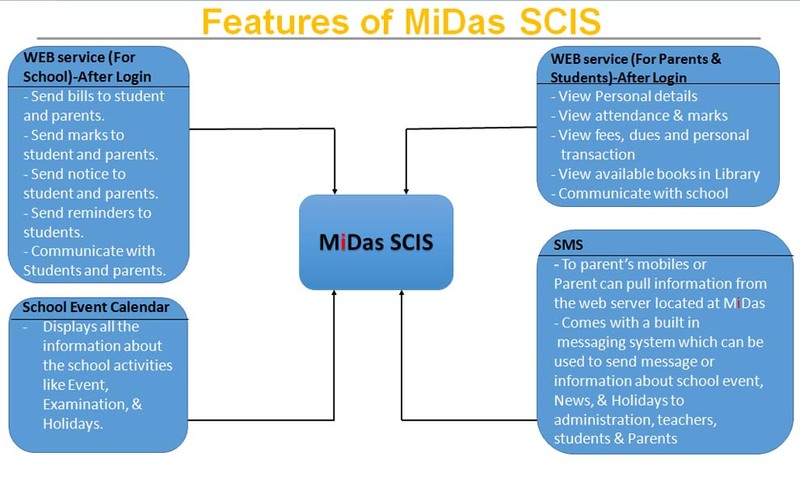 School Communication Information System – MiDas SCIS is a platform where important information can be transfer among stakeholders ( School Management, Teachers, Students and Parents) through Internet or SMS service. This information is captured in MiDas Student Management Information System can be accurately transferred to concerned stakeholders of the school by using Web application and Mobile application. Using this system the stakeholders can communicate between them through Internet and SMS. It also has Online Communication Scheduling System, which manages time for LIVE communication between the parents and corresponding teachers. Once the appointment is confirmed, parents and teachers can communicate ONLINE through Viber or Skype. This application is designed with an aim to meet your communication objectives by providing an effective communications.